It's kind of incredible to imagine that we're giving billions to Amazon and it won't agree to remain neutral on unionization. As always, in deals like this one, there are big promises to create big jobs for many people, and big promises of big profit for the government. It looks like Trump and Scott Walker's big giveaway to Foxconn didn't produce the jobs it promised. Will Amazon keep its word? I'm pretty confident it will keep its word to discourage union. After all, Amazon is not known for its worker-friendly environment. They don't like it when people go to the bathroom. The environment is not particularly conducive to safety. It's not the kind of factory job you'd jump up and down about. This account states they treat warehouse workers as robots. As if that's not enough, this plan precludes two LIC schools that were to be created. I don't know what you do every day, but I wake up and come to the most overcrowded school in New York City. After I teach, I sometimes begin to walk to my department office, right down the hall. However, the traffic is so bad, more often than not I turn around and go downstairs. From my perspective, teaching 34 students in half a classroom, I’m not particularly concerned about where the world’s richest man parks his business, let alone his helicopter. Can you believe we're building a helipad for the richest man in the world, and he turns around and says he opposes working people organizing for better conditions? Perish forbid that New Yorkers (if indeed it is New Yorkers hired for this enterprise) should negotiate for decent working conditions. Amazon, evidently wants to reserve the right to maintain the sub-standard environment it offers workers elsewhere in the country. Bill de Blasio regularly gets painted as far-left, some kind of commie weirdo dirty hippie or something. Andrew Cuomo is on a crusade to persuade us that he's the second coming of Bernie Sanders. Where do they stand on this? I hear crickets, and only faintly at that. While the troglodyte from Starbucks walks around casting calls Americans have health care and billionaires pay taxes as extreme, the fact is most Americans support those policies. Most Americans also support calls for a living wage. The fact is that union is the best way for most working people to get their voices heard. In numbers we are always stronger, and we need to get back to that, rather than continue to abandon it. The extreme right's suppression of union began with the killing of PATCO by Saint Ronald Reagan, and continues today in the form of the unelected, unrepresentative SCOTUS passing Janus. They're not finished either. If Cuomo and de Blasio wish to continue representing themselves as the voice of the people, they'll tell Jeff Bezos to take his stinking helicopter and fly to Mississippi or some other "right to work" paradise, where they can exploit people and they'll still keep voting for Donald Trump and his ilk. Most Americans want decent working conditions. 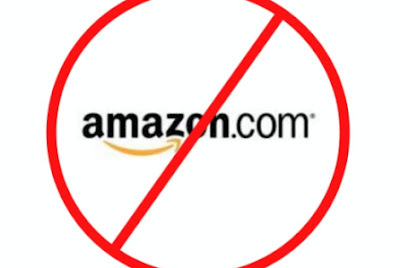 If Amazon doesn't, it doesn't deserve our business, let alone the excessive and profligate corporate welfare being showered upon it by people claiming to represent us.